This is a beautiful 1944 or Showa 19 large Japanese wall map of the Philippines, issued during World War II. It covers all the Philippine Islands from Luzon, south as far as Borneo. The map offers superb detail regarding both topographical and political elements. Notes cities, roads, trade routes on sea and land, and uses shading to display oceanic depths. 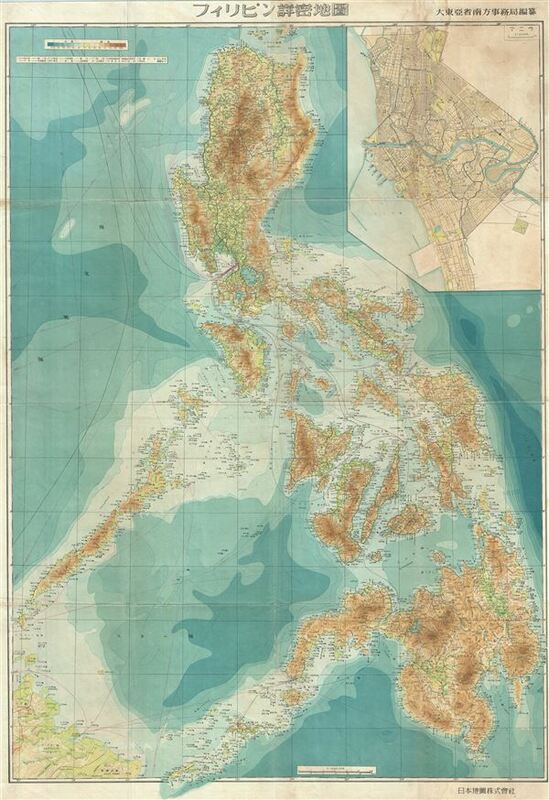 A large inset of Manila is included in the top right quadrant of the map. TheÂ PhilippinesÂ were considered to be of great strategic importance because their capture by Japan would pose a significant threat to the U.S.Â The Japanese occupation of Philippines occurred between 1942 and 1945, but the Allied forces of the U.S., Philippines and Mexico regained control of the island in 1945. This map was issued by the Japanese in 1944. All text is in Japanese. Very good. Minor wear and toning along original fold lines. Some foxing and water stains at places. Professionally flattened and backed with archival tissue.